2013 Ford Fusion Hybrid Low-key, even-tempered, and frugal. Until its ions made it the big thing in batteries, lithium’s best-known use was as a medication for the treatment of bipolar disorder and depression. It is a mood stabilizer, a drug that levels out the ups and downs of the day. And apparently it has worked that same psychopharmacological voodoo magic on the redesigned 2013 Ford Fusion hybrid. In an astounding feat of EPA-rated fuel-efficiency equilibrium, the new Fusion hybrid is rated at the same 47 mpg in the city, on the highway, and in combined use. That’s 47/47/47. And it’s up from the old Fusion hybrid’s 41 in the city and 36 on the highway. Moods, or fuel-economy figures, don’t get much more stabilized than that. 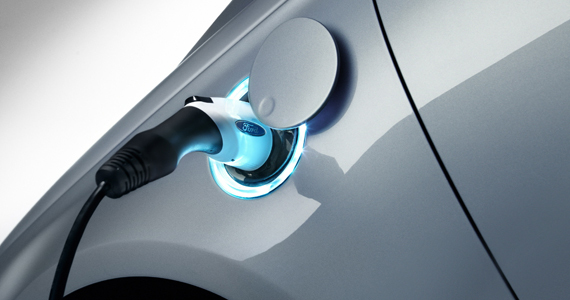 A new lithium-ion battery pack is an essential element of the significantly evolved powertrain. The new batteries replace the nickel-metal hydride ones used in the previous-generation Fusion hybrid and combined with a new, more powerful 118-hp electric motor allow the new Fusion hybrid to operate solely on electric power at speeds up to 62 mph. That’s up from 47 mph in the previous Fusion hybrid. Instead of running the 156-hp, 2.5-liter Atkinson-cycle four that the old Fusion paired with a 106-hp electric motor, the new Fusion gets a more efficient 2.0-liter, 141-hp Atkinson-cycle four and a 118-hp electric motor. As before, a continuously variable transmission (CVT) oozes power out through the front wheels. 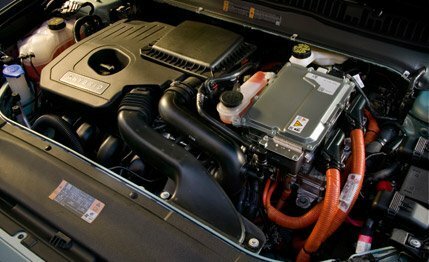 Ford claimed a net 191 hp for the 2012 Fusion hybrid and says the 2013 Fusion hybrid’s drivetrain nets a slightly lower 188 hp. Our acceleration estimates peg the new Fusion hybrid at about a half second slower to 60 mph and through the quarter-mile than last year’s model. Around town, however, the 2013 Fusion hybrid feels delightfully responsive, no doubt due to the fact that the hybrid’s electric motor delivers its maximum-rated 117 lb-ft of torque (an increase of 11 lb-ft over last year’s hybrid) instantaneously. Never does the new Fusion hybrid’s powertrain feel anything but tractable. 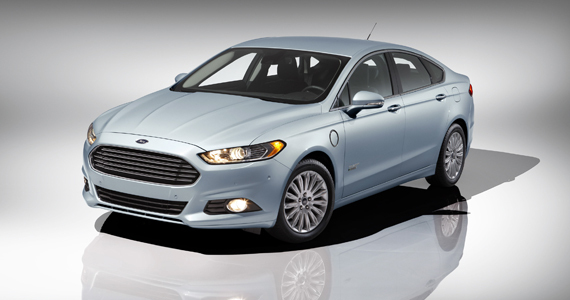 Ford also has packed the hybrid drivetrain efficiently into the new Fusion body shell. For instance, despite the batteries, the rear seat folds flat to handle longer cargo. And passenger accommodations don’t seem compromised at all. The cabin overall is roomy and the seats are comfortable, although ingress and egress into the rear seat can be difficult and the interior is a bit starkly decorated. In most ways, the new Fusion hybrid drives at least as well as its more conventionally powered sibling Fusions. The electric power-assisted rack-and-pinion steering has some feel, and the strut-type front and multilink rear suspension is a bit firm but comfortable. The whole car feels solidly built. This isn’t a car for burning through corners, after all; it’s a car optimized to burn as little fuel as possible while completing its daily chores. As to the drivetrain itself, it all operates with seamless ease. 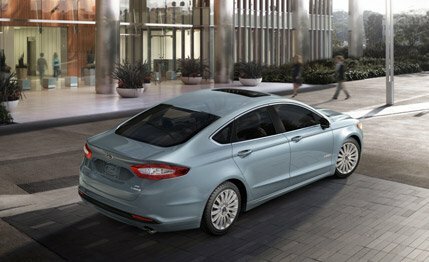 Because the Fusion hybrid is quiet no matter which motor is doing the pulling (Ford uses electronic sound-canceling technology to make the passenger cabin a virtual sarcophagus), it’s sometimes difficult to register exactly when there’s a transition from one power source to another. As with all hybrids, most drivers will require some virtuous coaching by the car itself to get the best mileage out of the system, but Ford’s provocations are among the least intrusive or obnoxious. Considering its impressive economy, beautiful exterior, sweet and easygoing personality, and reasonable $27,995 starting price, the 2013 Fusion hybrid is likely to be popular. However, it looks pretty much like any other Fusion from the outside, so if you’re looking for a hybrid that shouts its environmental virtue to the world, get a Prius. A well-kitted Titanium trim level will be added early next year for $32,995, so at least that one will look more expensive. This Fusion hybrid may soon be overshadowed by a new plug-in version that’s promised for early 2013. Dubbed the Fusion Energi, that car will feature huge EPA numbers — Ford is projecting more than 100 MPGe, putting it into Volt and Prius-plug-in territory. It could wind up the most zoned-out, mellow-mood moving machine, ever.